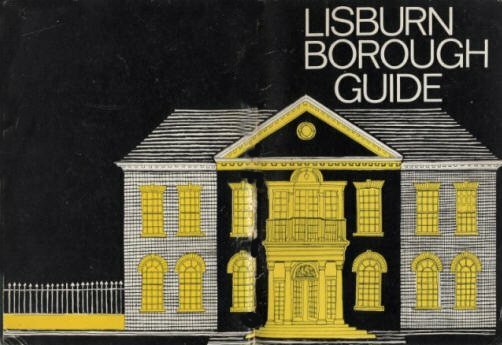 In attempting to produce a Borough Guide it is almost impossible to provide as much detail as one would like and at the same time ensure that the material makes interesting reading. This guide neither attempts to be a comprehensive reference book nor to provide a chronicle of all events that have been associated with the area but does attempt to supply some basic information which should be of interest to the visitor, the student, and the citizens of the area. It is hoped that all who read it may be encouraged to take a greater interest in the various aspects of life in the Borough. The Borough of Lisburn is a much enlarged area since October 1973 when local government was re-organised. The present Borough includes the old Borough of Lisburn and a number of villages, including Moira, Dromara, Glenavy and Dunmurry (see map, centre pages). The Borough has a population of approximately 81,000 and is one of the fastest growing areas in Northern Ireland. The old Lisburn Borough was an unincorporated Borough until 1885 and an Urban District from 1899 until 1964 when a Royal Charter of Incorporation was granted elevating Lisburn to Borough Status. 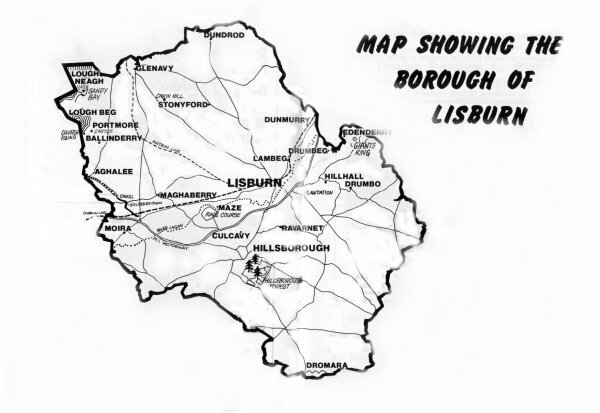 On the 30th September 1973, the Borough of Lisburn as then constituted ceased to exist and a new Council was established, the members having been elected in May 1973, in accordance with the Provisions of the Local Government Act (Northern Ireland) 1972 to administer the new enlarged Borough of Lisburn. The area is a region of contrasts from the up-and-down drumlin country of Down and the hills around Dromara to the calm of the Lough Neagh shore at Sandy Bay with its potential for fishing, boating and bathing to the hustle and bustle of the urban area of the Lagan Valley. Beautiful views across Lough Neagh to the Sperrins can be seen from the countryside above Dundrod (Bohill) and Glenavy's Crew Hill, a place where the ancient kings of Eastern Ulster were crowned. As a residential area Lisburn Borough is most conveniently situated being on the outskirts of Belfast and yet right in the middle of the Lagan Valley straddling the main routes North and South and to the centre of the province. The area is also adjacent to Aldergrove Airport, the main airport in Northern Ireland. Borough Offices, The Square, Hillsborough, Co. Down. Tel. 682477. A sub-office of the Borough Council is located in the Town Hall, Castle Street, Lisburn, Tel. 2259, where enquiries may be directed. Examination of food and inspection of food premises and vehicles, hairdressing establishments, etc. The abatement of nuisances and pest control investigations. Removal of derelict motor vehicles and litter prevention. Management of playing fields and provision of sports, community and tourist facilities. The reorganization of Local Government in October 1973 brought with it fundamental changes in the form and functions of Local Government. One of these changes was the new role given to local authorities in relation to the provision of a wide range of leisure facilities. 1. To secure the provision of adequate facilities for recreational, social, physical and cultural activities in the Borough as defined in Section 9 of the Recreation Et Youth Service (N.I.) Order 1973 and Section 18 Local Government Act (N.I.) 1966. 2. To provide tourist amenities, entertainment or activities as defined in Section 10 of the Development of Tourist Traffic (N.I.) Order 1972 and Section 26 of the Development of Tourist Traffic Act (N.I.) 1948. 3. To provide lectures, exhibitions, information centres, as enabled under Section 109 and 110 Local Government Act 1972. The Council maintains playing fields in Lisburn, Harmony Hill, Dunmurry and Hillsborough. A major recreation scheme will be completed at Warren Park, Lisburn, during 1976. This scheme, Lisburn Recreation Centre, will provide parkland and outdoor sports facilities. The outdoor facilities will comprise children's play areas, pitch and putt course, a putting green, a rugby pitch, three soccer pitches, two hard porous pitches, one with floodlighting, a running track, a bowling green and tennis courts. These facilities will be served with car parking space. The next phase of the scheme is pavilion and storage accommodation. It is the Council's intention to construct a Leisure Centre on this site. Such a facility may include multi-purpose sports provision, community and arts facilities and should provide a range of accommodation which is much needed in the Borough. Moira Demesne, 44 acres of land outside Moira, is being developed for the Council by Enterprise Ulster. Walk-ways have been created, water features developed and pic-nic sites made. A car park within the Demesne will provide visitors with the opportunity to bring their cars into the Demesne but will also ensure that the main area of parkland is kept traffic free. Pic-nic areas and facilities for children's play will be sited close to the car park. The Council has agreed to provide public lavatories and a transit caravan site with facilities for fifteen caravans. Duncan's Reservoir and the land surrounding is being developed for recreation purposes. Pathways through the wooded area are being constructed and there will be provision for children's play. During 1976 the Council will construct an Activity Centre at Glenmore, Hilden. This building will include an activity hall 60 ft. by 30 ft. with changing and showering accommodation, a committee room, coffee bar, toilets and storage facilities. There will be sufficient accommodation provided at this stage to ensure that the necessary changing facilities are available when the next phase of the development is complete. During this second phase two soccer pitches, children's play areas and probably a boating pond will be constructed. The indoor accommodation will provide valuable activity space for the people of the immediate area and will also be available to people from the Borough at large. 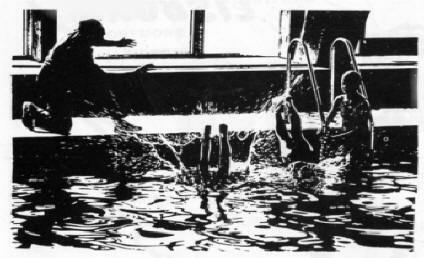 Lisburn has probably the busiest two pool complex in the province and during 1974 a quarter of a million swims were taken in the pools. Further information may be obtained from the Manager of the pools - Tel. Lisburn 2306. Lisburn Borough has a wide variety of sports clubs and a list of the sports available in the Borough appears on page 19. The Lisburn Sports Advisory Council continues to play an important role in the community and is active in the promotion of sport in the Borough. The Council has recognised that the Arts must not be neglected and has in consequence given its full co-operation to the Arts Council of Northern Ireland. Exhibitions of paintings, drama and orchestral performances have been arranged in association with the Council and in co-operation with schools in the Borough. In recognition of the need to involve local people in the promotion of the Arts and cultural activities in the Borough the Lisburn Arts Advisory Council was formed. Through this group it is hoped to co-ordinate and promote art activity in the area and try to ensure that cultural activities of all kinds are fostered. A programme of future activities has been developed which will ensure that many more activities will be available to the people of the Borough. The Council has recognised the tourist potential of the Borough and the many assets which it has to offer, and it is understood that tourism benefits everyone. A folder, 'Lough Neagh - Ulster's Inland Sea', is available from the Borough Council. A transit caravan facility, referred to above, will be provided at Moira, close to the M1 interchange. This facility should prove invaluable to tourists coming into and going from the province and should benefit the village of Moira in particular. The Borough Council owns one community centre in West Lisburn. This centre is extensively used and provides a base for a wide range of social and educational activities. The Council has provided services to Community Associations in the area since October 1973 but will extend this service from April 1976. The Council will be enabled to provide financial assistance for a variety of community services. (c) Running costs of resource centres. Capital projects relating to the provision of community buildings will be dealt with by the Borough Council. Where a community centre is provided by a community association, grant to the association will be paid by the Borough Council. The number and extent of capital projects will depend on the amount of money available from the Department of Education. Councillor G. E. McCartney, J.P.
Councillor T. C. Wilson, J.P.
Councillor W. L. Henry, B. Comm. Sc. F. C.I.I. Alderman S. Semple,'M.B.E., J.P., F.R.S.A. Lisburn BT27 4AW Councillor R. W. C. Kirkwood, B.Sc.(Econ. ), A.L.A. Alderman Dr. G. W. C. McCartney, M.B., B.Ch., M.R.C.G.P. Councillor R. J. McNeice, M.I.T.E., F.T.C.